Chocolatey maintains its own state of the world, while Windows maintains the state of Programs and Features. If an application is upgraded or uninstalled outside of Chocolatey, such as is the case with Google Chrome and its auto updating utility, Chocolatey doesn't know about the change. The synchronize feature keeps Chocolatey's state in sync with Programs and Features, removing possible system-installed state drift. I'm a business customer, now what? Do I get the packages to add to source? How do I get machine parseable output? What if I have an existing package that is just not tracking to Programs and Features? In all licensed editions, Chocolatey syncs the state of already installed Chocolatey packages (nupkg files) to the state of the software they are linked up with - so if the software is uninstalled or upgraded outside of Chocolatey, it removes the package or notes the upgrade. This behavior is known as automatic synchronization or autosync for short. There is also choco sync, which is different and is covered in Sync Command below. There is an important distinction between packages and software to understand with Chocolatey. Chocolatey manages packages (nupkg files), and packages manage software. Many packages are what we call "installer packages" - packages that manage an installer and an installation into Programs and Features. Once that software is in Programs and Features, it could be manipulated outside of Chocolatey. If it is removed without the command going through Chocolatey, open source Chocolatey will still have the package installed (which is technically correct from a package manager state, but incorrect based on expectations). With open source you end up with a disconnect if you are not careful. Licensed editions of Chocolatey are able to see system state and correct this discrepancy with autosync by updating the state of the package based on what has occurred outside of Chocolatey. For software management, which encompasses package management and above that for Windows, the state of the software is really what should be reflected with those installed packages. So if that software has been uninstalled from Programs and Features or upgraded outside of Chocolatey, autosync removes those packages to match that state or notes the upgrade (note it doesn't change the version of the package - that's much trickier to get correct). As commercial editions lean more towards software management, they have much better system integration. Autosync is great for ensuring that Chocolatey matches the state of changes on the system for what the packages it is tracking. In the image above, someone manually removed the 1Password software. On the next run of Chocolatey, auto sync sees the software has been removed, so it removes the package tracking to that software in response to those system changes. There are none - automatic sync just happens every run. You must have a licensed edition of Chocolatey (Pro, MSP, or Business). Pro is a personal, named license that costs about the price of a lunch outing per month and comes with several other features. Business editions are great for organizations that need to manage the total software management lifecycle. MSP editions contain a subset of the Business edition features. Chocolatey tracks applications that it installs, so it is able to keep up with those applications as they are upgraded and uninstalled, even outside of Chocolatey. Starting in 1.9.0 of the licensed extension, sync has been added as a preview feature for organizations to try out. Currently Business edition only, but expected to be in Pro+ at some point - check https://chocolatey.org/compare#compare for availability. Sync looks at all software that is in Programs and Features that is not being managed with Chocolatey packages and brings them under management. This means you can run one command and suddenly, all of the software installed on a machine is under management by Chocolatey! 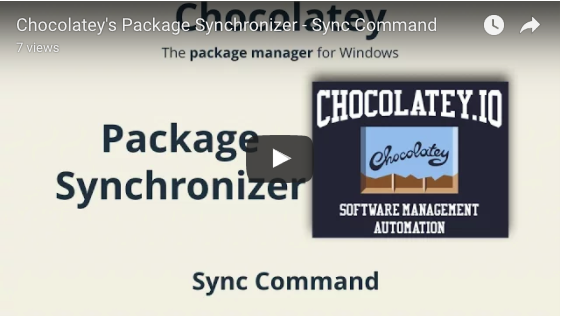 To synchronize your system, Simply call choco sync and Chocolatey will ensure that all software in Programs and Features comes under Chocolatey management and provides you the packages/package sources so you can add them to source control for managing those packages over time. In the following image, sync is run on a system that has 18 applications installed and a base Chocolatey for Business install. Note after running sync, all software on the machine is now being managed by Chocolatey. The following are available in the choco sync command. You must have the business edition of Chocolatey. Business editions are great for organizations that need to manage the total software management lifecycle. You would periodically run choco sync. Chocolatey takes a look at all software in Programs and Features that is not under Chocolatey management, generates packages on the fly and baselines them under the Chocolatey install, ensuring all of the links are tracked. Yes! Chocolatey will tell you the location of the sync files so you can put them into source control. Generating packages on the fly from Programs and Features for non-MSI installers doesn't provide everything necessary to ensure an actual install. So when you take those packages back to source, you will need to finish out the packaging for those so that later when you upgrade, things will work appropriately. Use -r. choco sync -r. Requires Chocolatey v0.10.4+. Synchronize can recognize existing packages and sync to those as long as the name of the package is a close match to the software name (e.g. Google Chrome becomes either google-chrome or googlechrome). Any packages you've installed side by side (-m) will show up every time during sync. If you have both a 64-bit and 32-bit version of some software installed, sync will track to one on the first run and the other on the next run. This is not a normal scenario. In C4B, you can flip a switch and see all packages in Programs and Features, even those packages that don't have underlying native installers! This makes reporting back to legacy inventory reporting systems a snap. Chocolatey for Business (C4B) Edition. Chocolatey Licensed Extension (chocolatey.extension package) v1.10.0+. showAllPackagesInProgramsAndFeatures - Package Synchronizer's Packages In Programs And Features Synchronization - Show all packages in Programs and Features, not just packages that use a native installer. Once you set the feature, it just works automatically. Chocolatey tracks packages that manage natively installed software. For packages that are zip archives or configuration, Chocolatey will add an entry into Programs and Features based on the nuspec. It's smart enough not to add an entry for a meta-package - say notepadplusplus and notepadplusplus.install are installed. The meta-package would be notepadpluplus. MSU type packages will show up - Chocolatey doesn't automatically track Windows Updates types of installers. So if you install WMF 5 through Chocolatey and turn this feature on, it will show up as well. You must run choco at least one more time after setting the feature for it to take effect. So flip the feature and then run choco -v.